Sending a greeting card for a special occasion is a great ministry. I remember when my husband was Pastor of a church in Ohio several years ago there was a very lovely lady who kept great track of special occasions of the congregants, including anniversaries. It was her ministry to send out welcome letters and greeting cards. She would often include a special Bible verse or other Christian quote. 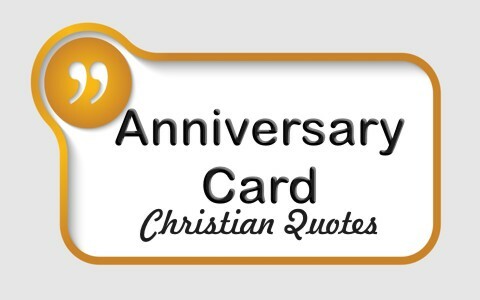 Here are 17 Christian quotes that you might want to use in an anniversary card. I pray that as you search for just the right quote to put into an anniversary card that you will be a blessing to the recipient. Do you have any favorite Christian quotes that might fit well for an anniversary card? Feel free to share it in the comments below. I have put together with the help of the Lord a line of Religious & Christian handmade greeting cards and pictures. My cards and pictures TELL people how to get saved. Tell people how to go to heaven.I want to sell them to somebody that know what what to do.My cards and pictures can help thousands and thousands of people come to God.Will you help me get the message out to the people? Nice words.It will give Inspiration. Previous post: What Is Eternal Or Everlasting Life? Next post: What Does The Bible Say About God Taking Care Of You?